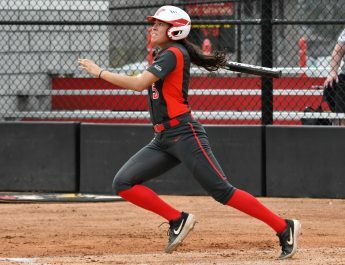 Demi Ann Patonis probably isn’t a name that many fans of the Youngstown State University softball team know, but the freshman came through in the bottom of the sixth inning on Friday to give the Penguins a 5-4 win over the University of Illinois at Chicago. 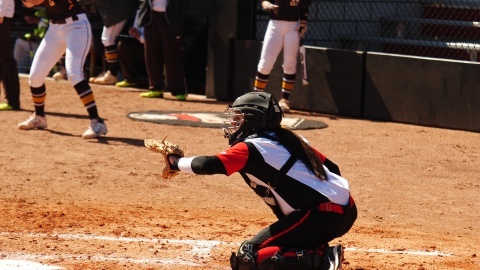 Youngstown State University catcher Maria Lacatena behind the plate during the softball team’s game at the YSU Softball Complex. With two outs and YSU’s Alexa Schmidt at third base, Patonis came to the plate with the go-ahead run in scoring position. On the first pitch of the at-bat, Patonis singled to left field to give YSU a 5-4 lead. 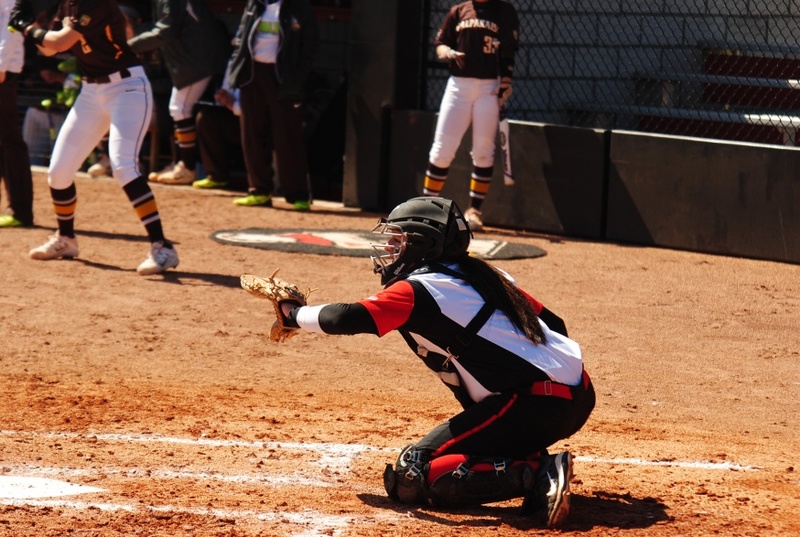 YSU (18-13, 5-2 in the Horizon League) lost the first game of a doubleheader 7-2, but YSU regrouped in the second game. The Penguins used their “small ball” style of play to generate offense in the second game of the doubleheader. UIC entered the game with the top pitching staff in the Horizon League. “Maria [Lacatena], I think in both games, I think she did fairly well. I think she went 3-3 with a couple RBIs there,” Campbell said. “So, on top of that, just trying to take that mentality and letting it go through to get the next person their at-bats. In the bottom of the first inning of game one, YSU catcher Maria Lacatena hit a two-run single to left field to drive in Sarah Dowd and Miranda Castiglione to give YSU a 2-0 lead. After UIC (20-12, 6-2 in the Horizon League) fought back to take a 3-2 lead, YSU infielders Brittney Moffatt and Katie Smallcomb hit back-to-back doubles to give the Penguins a 4-3 lead. In the top of the fifth inning, UIC first baseman Laura Swan hit a groundball to Smallcomb at shortstop, but Smallcomb committed an error. UIC centerfielder Lexi Watts scored on the play to tie the game at 4-4. Patonis drove in the game-winning run in the next inning. YSU pitcher Caitlyn Minney pitched a complete game allowing four runs on five hits and three walks. Even though the Penguins dropped the first game of the day, YSU’s comeback in game two could have an impact on the rest of the season. The Penguins won 11 of their last 13 games, and Patonis said the win could give YSU more momentum for the next couple games.